Pizza can be a healthy option with these tips and recipes. October is National Pizza Month, and we know what you're thinking. Pizza is for couch potatoes and Teenage Mutant Ninja Turtles, not for athletes. Well we've got good news. Pizza doesn't have to be bad for you, and there are a ton of ways you can boost a pie's nutrition and build a smarter slice. STACK talked to Chef Glenn Lyman, whose nutritious cooking has fueled elite athletes such as LeBron James, Steve Smith and Ryan Lochte, about creating healthy pizzas. What you put on your pie can really affect its nutritional value. Yes, they're tasty, but toppings like pepperoni, sausage, ham, bacon, etc., can push a pizza from poor nutritional choice to downright abhorrent. Most of us don't prefer a plain pie, so Lyman recommended some toppings that add flavor without bankrupting your pizza's nutrition. Since we have a heart, we're not going to tell you to eat a cheese-less pizza. A pizza with no cheese is just about the saddest thing we can imagine. But what you should do is substitute healthier cheeseÂ for standard pizza cheese, which is usually processed and shredded. Lyman likes to add a variety of flavorful vegetables that keep the calories low but the vitamins and the taste high. "Try roasted peppers, sweet potatoes or zucchini for nutrient rich toppings. Throwing some kale on can add calcium and antioxidants," he says. If you think you'll have a tough time enjoying pizza sans meat, Lyman's got a trick for you: "Portobello mushrooms give you that nice, meaty texture without the sky-high fat of traditional pizza toppings. They're low in carbs, too." If you simply have to have meat, italian chicken sausage is flavorful and healthier than most other meat toppings. Since we have a heart, we're not going to tell you to eat a cheese-less pizza. A pizza with no cheese is just about the saddest thing we can imagine. But what you should do is substitute healthier cheese for standard pizza cheese, which is usually processed and shredded. Fresh mozzarella is usually lower in fat and sodium than the shredded store-bought variety, and without all of the preservatives. "Try fresh mozzarella instead of gobs of the shredded stuff. Each ounce contains only 70 calories," Lyman says. Shredded parmesan is big on flavor but light on calories and fat. "Shredded parmesan is another healthier cheese option, since a little bit can go a long way. Sprinkle some on top of a cooked pizza for a lighter topping with a punch of flavor," Lyman says. If you're looking to pack some protein into your healthy pizza, tofu is the answer. "Try diced or crumbled tofu instead of the usual cheese topping. It's non-dairy, low-fat, high protein and has that real cheese texture," Lyman says. Traditional pizza sauce isn't nutritionally terrible, but it contains a moderate amount of sugar and sodium, and doesn't have much going for it in terms of vitamins and nutrients. Changing your sauce can be a fun and healthy way to mix things up. Substituting hummus for traditional pizza sauce can be a way to vary the flavor and add a few unexpected nutritional benefits. "Using creamy hummus in place of sauce adds extra fiber and protein," Lyman says. Pesto sauce is another tasty change-up, and it's high in heart-healthy fats and antioxidants. "Pesto works great as a sauce and adds healthy greens and omega-3 fatty acids," Lyman says. 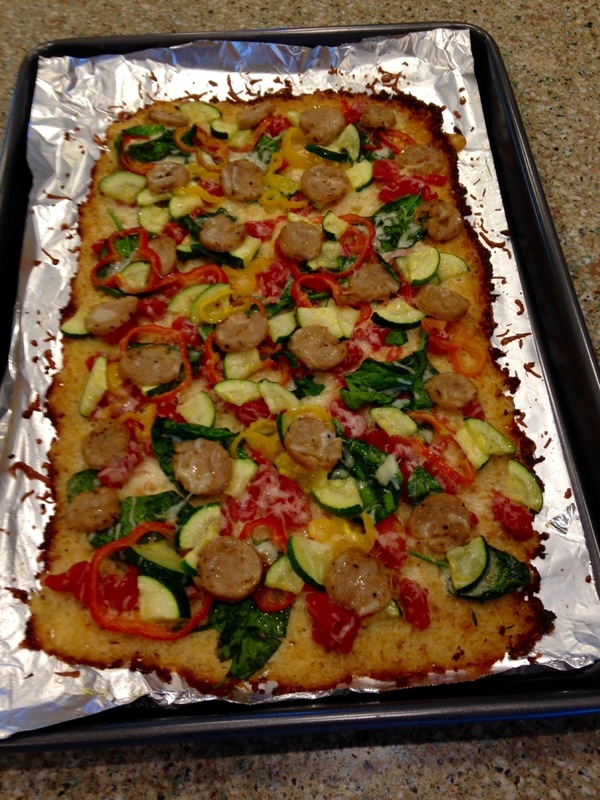 Lyman shared one of his favorite healthy pizza recipes. The biggest difference between his pizza and a traditional pie? A cauliflower-based crust, which adds protein, vitamins and antioxidants while avoiding the carb overload brought on by normal pizza crust. Line a rimmed baking sheet with non-stick foil or parchment paper. Grate the cauliflower (like you'd grate cheese) until you have 2 cups of crumbles. Place the crumbles into a large bowl, cover it and microwave for 8 minutes or until soft. Let the cauliflower cool and pat with paper towels to remove the water from the cauliflower. The drier the cauliflower, the crispier the crust! Add 1 egg, 1 cup of mozzarella/parmesan cheese and a small amount of salt and pepper to the cauliflower. Mix until ingredients are thoroughly combined. Apply non-stick spray to the pizza pan and pat the cauliflower mix into a thin, 10-inch circle on the pan. Bake for 10-15 minutes or until golden. Remove from oven and add the sauce, cheese and desired toppings. Put back into the oven until cheese is melted and bubbly, usually another 10 minutes. When it's all said and done, your healthy pizza should look something like this. For more recipes and cooking tips from Lyman, check out Gcooks.com and follow him on Twitter. We Tried Cricket Protein Bars. Should You?